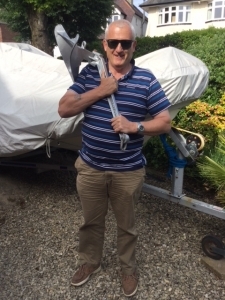 Our raffle for an anchor at the Poole Harbour Boat Show was won by Dave Laut who was very pleased. He is a Safety Officer for Poole Harbour Commissioners and will be attending the Bournemouth Air Show on his boat to keep the water safe for everyone. We will also be at the Bournemouth Air Show and have booked a stand near Boscombe Pier from 30 August to 2 September – we hope to see you there.